To build a flexible and tidy cabling system. Patch panels are something we can never forget. The panel enables speedy UTP interconnections to hubs, routers, and other active equipment. Ethernet patch panel on the market comes in various types, such as 24 port patch panel or 48 port patch panel for Cat5e or Cat6 that is shielded or unshielded. So what’s difference between Cat5e Patch Panel and Cat6 Patch Panel? Can I use cat5e rated patch panel with cat6 cabling? Cat 5e patch panels meet the standards of TIA/EIA 568 industry specifications, which can help enhance the network performance in a maximum and keep up with the growing changes in your network. 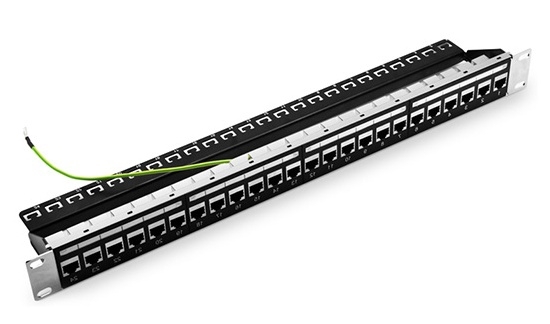 For now, there are many Cat 5e patch panel products that customers can pull off the shelf. Cat5e Ethernet patch panels from reliable supplier like FS are made from steel materials so that they can stand up even the most extreme conditions. With numbers labeled on ports, it’s easy for cable organization. FS Cat5e patch panels are available in 6-port and 8-port module groupings, in 8, 12, 24, and 48-port sizes. The high density panel design can be mounted to standard racks or cabinets, accommodate top, bottom or side cable entry, and also save valuable rack space. As it’s name suggests, Cat6 patch panels is specially designed for Cat6 cabling in 1 Gigabit Ethernet applications. With the help of these patch panels, you can achieve easy management and save data center rack space. They can meet or exceed the TIA/EIA 568 industry specification. All these Ethernet patch panels feature both T-568A and T-568B wiring configurations. Each patch panel terminates with standard 110 termination tools on the rear, which allows quick installations. Panels in FS cover 12, 24, 48, and 96-port configurations. Patch panels can be configured with six or eight port modules. Cat5e vs Cat6 Patch Panel: Can I Run Cat6e on a Cat5e Patch Panel? When punching down Cat5/5e wire on a Cat6, the Cat5/5e wire is enough smaller that it is possible to get what looks like a good punch, but the insulation on the wire is not actually penetrated or is only partially penetrated by the vampire jaw of the punch block. When punching down Cat6 wire on a Cat5/5e panel, the larger wire can end up bending or even breaking the vampire jaws on the punchdown block. In both cases, using care and testing each connection, you can usually make it work. If your just doing one panel at home you are probably OK. However it wouldn’t be recommended if doing several panels or working on an enterprise/commercial jobs that you plan to warrant the work. This entry was posted in Optical & Copper Network and tagged cat6 patch panel, ethernet patch panel on December 15, 2017 by Admin.